Plant Select® Petites debuts well-adapted, smaller plants that have not yet been readily available to gardeners. Enjoy these treasures in garden situations where small gem-like but tough plants are best suited: troughs, permanent containers, rock gardens, patio gardens, fairy gardens, green roofs, and smaller gardens. 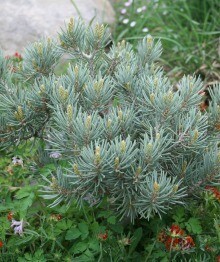 What could be a better choice for beauty and interest year-round in a water-wise garden than a dwarf blue pinyon pine? Slow-growing, adaptable and durable, Blue Jazz is the most ornamental of the dwarf pinyon pines now available. A dwarf globe shape, true blue needle color, and xeric nature make this conifer a real winner. It is the perfect addition to any garden that needs a permanent small evergreen presence. 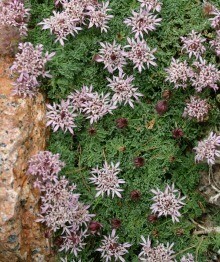 This high-altitude native of the Moroccan Atlas Mountains possesses many ornamental characteristics: low mat-like growth with uniquely textured evergreen leaves, short-stemmed pincushion-like dusty-rose-colored flowers, and attractive silvery seed heads. It is truly a four-season stunner. Be sure to plant in well-drained soil with full sun exposure for best performance. To appreciate this treasure be sure to plant it in an easily observable site or in a container garden. Its slow growth will reward you with tight green cushions and bright yellow starry flowers in springtime, and tight green cushions nearly year-round. This true miniature will thrive if given a few rocks to nestle up to. 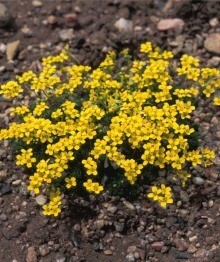 Try to isolate it from more vigorous growing plants so that its diminutive, mounding habit can perform its best.